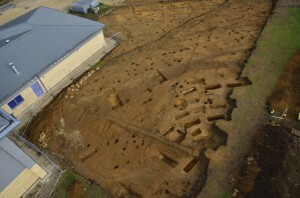 Cotswold Archaeology made an exciting discovery of part of a Roman cemetery during excavations at Cotswold School, Gloucestershire, prior to the building of their new Maths Block. Twenty-one human burials were excavated, eighteen are most probably Roman in date, with three more suggestive of earlier Iron Age dating. The inhumation burials were of males, females, children and infants. At least two of the adults were buried in stone cist-type graves (where the sides of the grave are faced with stone) and four infants were buried in smaller stone box cists. Similar stone cist graves have been found across southern England and are generally thought to date to the late Roman period. The position of the feet of one of the child burials seems to suggest that this child was buried in a shroud. Other interesting grave finds include a Roman Denarius coin (dating to the 2nd century AD) which was probably placed in the mouth of one of the adult males, as per the Roman belief of providing payment to the ferryman Charon to row the soul of the deceased across the River Styx the land of the dead. Earlier, Iron Age finds include a further three burials, Iron Age pottery and a group of postholes that could indicate a partial roundhouse in the south-eastern part of the site. 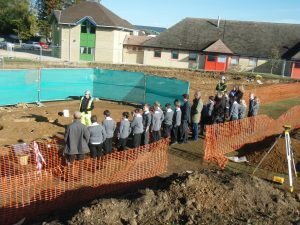 Pupils at Cotswold School enjoying a talk from Cotswold Archaeology on site.